High precision compact wet wet differential pressure transmitter with digitally corrected 4-20mA current loop or amplified voltage output signal in pressure ranges from 1 up to 30 bar differential. The PD 33X high accuracy differential pressure transmitter is for applications requiring high accuracy dp measurements with the flexibility of re-ranging the output signal whilst still retaining a high degree of accuracy over a wide temperature range. The PD33 X high precision differential pressure transmitter which incorporates smart electronics that provide the option of a RS485 digital signal with either an analogue current output or amplified voltage output signal. 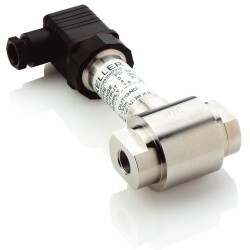 The PD33X high precision differential pressure transducer can measure with an accuracy of ±0.15% full scale over a temperature range of -10 to +80°C with the analogue signal output and ±0.1% with the RS485 digital output signal. The small size and low mass of the PD33X differential pressure sensor compared with more conventional process dp cells allows it to be used in applications where there is limited space and no convenient mounting point. The PD33X high accuracy differential pressure transmitter is best suited for medium differential pressure applications for flow or filter condition monitoring from 0.2 Bar up to 50 Bar differential. The standard maximum static line pressure is 200 Bar but higher static line pressures can be specified up to 600 bar if needed. It is important to note that due to the small size construction there is no mechanical stops built into the design to prevent unintentional high overload pressures being applied to one side only. If you need high overload protection on one side, the PD39X differential pressure transmitters would be more appropriate. The sensing technology used in the PD33X precision differential pressure transmitter is an all stainless steel 316L oil filled semiconductor strain gauge capsule which has a good over-pressure rating in the positive direction of two times. 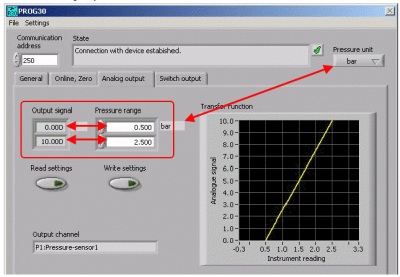 Since the accuracy of this digital differential pressure transmitter is so high it is possible to trade some of this accuracy for higher over-pressure by selecting a higher base pressure range and down-ranging the electronics to the desired pressure scaling. Inside the electronics housing of this high accuracy dp sensor is a microprocessor with an integrated 16 bit A to D converter. A 0-10 volt amplified voltage output or a 4-20mA current loop output signal can be chosen and each has the RS485 communications interface for configuring the pressure sensor or supplying a digital output signal. The high accuracy over a wide temperature range is achieved by mapping the differential pressure readings of each transducer over the compensated temperature range during manufacture. The results of the mapping are mathematically modelled to produce polynomial compensation coefficients which are then stored in the differential sensors non-volatile EEPROM memory. For hazardous area environments the ATEX approved version of PD33X Ei high accuracy dp sensor can be used with an appropriate IS barrier. Can the PD33X be used to measure a dp of 0 to 5 psi with on a line pressure up to 60 psi? Yes a standard 1 bar range can be rescaled via the software and USB interface so the analogue output corresponds 0-5 psi differential. 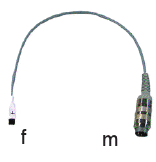 What is the accuracy of the 4-20mA and digital output for a differential range of 1 bar? Is the PD33X compatible with seawater? It is possible to make the wetted parts of the PD33X from Hastelloy C276 to protect them from seawater corrosion. How should the PD33X be installed to measure liquid level in a sealed tank? The positive port should be connected to the bottom of the vessel. It is important to ensure that no air is trapped in the pipe and it is completely filled with liquid. The negative port should be connected to the top of the vessel to reference the gas pressure at the top of the tank. It is important to ensure that no liquid is able to enter the negative side connection during installation or use, because this will create a column of liquid which will add pressure to the negative side and affect the liquid level reading. Will the PD33X tolerate the line pressure on one side only? If the line pressure exceeds the overpressure rating for the positive or negative side then the answer is no. If a line pressure greater than the overpressure rating is applied to one side only then the sensor maybe damaged and may not be able to contain the pressure. The sensor will only tolerate a pressure on both sides at the same time, up to 200 bar as standard. Will the accuracy of the PD33X be affected by a change in line pressure? A change in static line pressure will affect the accuracy by up to 0.005%FS for a 1 bar change in line pressure. 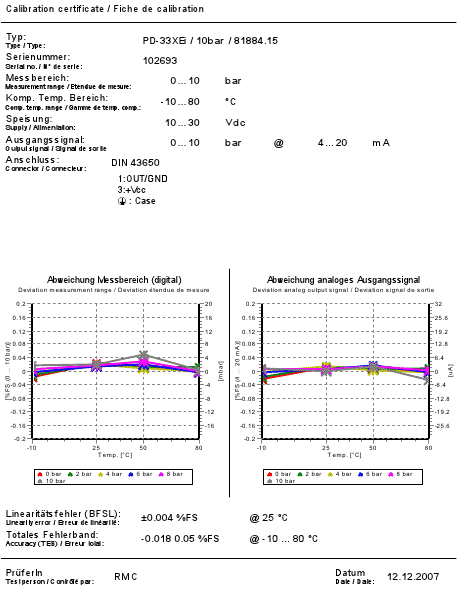 For example if the line pressure changed from 50 to 150 bar, the affect on accuracy could be as much as 0.5% full scale. The sensor is calibrated at atmospheric pressure, so you will have to account for the effect of a 100 bar change. This error is mainly a zero shift in pressure reading, so if the line pressure is constant it can be removed with a zero tare to the output at zero dp. Can you confirm that the PD33X dp transmitter can be powered by a 13V tension? The supply voltage required for the 4-20mA output to work is between 8-28 Vdc. This excludes any extra voltage required for additional load resistance in the current loop circuit. Could you please tell me the accuracy of the 4-20mA output from the PD33X High Accuracy Differential Pressure Transmitter? It is +/-0.1% of full scale range, over a temperature range of 10 to 40 degC and +/-0.15% over -10 to +80 degC for the 4-20mA output. We have a PD33x differential pressure sensor with a scaled pressure range of 0-2 bar diff and a base pressure range of 3 bar diff. We used it for 0-2 bar which was fine, but now we have process conditions with a higher differential pressure up to 3 bar. Is it possible to use the same sensor and change the scaled pressure range to 0 – 3 bar diff? The closest standard base range to 2 bar is 3 bar so if it is not a custom range device it should be possible to measure over 3 bar, as long as it is possible to access the RS485 connection, which has to be connected internally when the sensor is manufactured. It should be possible to determine this from the label on the sensor, the calibration certificate, or if necessary the serial number can be traced back to determine whether it was connected. If the sensor you have is RS485 communications ready, you will now need the USB to RS485 converter so that you can connect it to a Windows PC computer. A software package called Control Center Series 30 (CCS30) is provided with the digital interface converter which will allow you to re-scale the analogue output to any range between zero and full scale pressure. If the sensor has a DIN plug connector then you will not be able to access the RS485 without removing the DIN plug assembly and using a special Molex adaptor to access the RS485 connection located on the PCB underneath. The following image shows the software configuration area and you would click on the “Analog Output” to select the required scaling. What is the max differential pressure a 30 bar range PD33X is able to accept? According to the data sheet spec, the 30 bar range can tolerate a 60 bar overpressure in the positive direction and a 20 bar overpressure in the negative direction. Some calibration shift maybe noticed if base range of 30 bar is exceeded. What kind of calibration certificate comes with the PD33X differential pressure transmitter? As standard the PD33X is supplied with a calibration certificate which includes information about the sensor such as product type, pressure range, output signal, serial number and wiring connections. The calibration data is plotted on a graph, which shows a series of percentage of full scale deviation errors for series of pressure points repeated at different temperatures. Each pressure point is represented by a different colour to distinguish the temperature characteristic for a particular pressure reading. 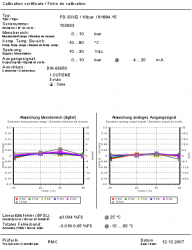 The maximum linearity error at room temperature (25°C) and the maximum total error (TEB) at the two extreme temperature is shown at the bottom of calibration certificate. On the PD33X differential pressure transducer data sheet, what is meant by the specifications highlighted below? The top highlighted line refers to the maximum allowed overpressure of the differential range in the reverse direction, e.g. a 1 bar differential range has a negative overpressure limit of -2bar, so damage may occur if the differential pressure exceeds -2bar. The bottom line refers to the static line pressure (200 bar is standard and 600 bar is a special option), the overall pressure of the system, e.g. a system maybe at 20 bar pressure and a differential pressure of 1 bar is created along a narrow restriction as the media flows into a low pressure part of the system. It is important to ensure that the sensor you use is rated to the system pressure to ensure pressure containment. The PD33X will only tolerate the static line pressure on both sides, if you vent one side without venting the other side, it will damage the sensor, unless it already happens to be within the positive/negative differential overpressure range. Most compact differential pressure sensors such as the PD33X work in this way. The more larger process type of differential pressure transmitters such as the XMD, include mechanical stops so that they can withstand much higher pressures on one side, and therefore the differential over-pressure ratings are closer in magnitude to the static line pressure ratings with these devices. I am looking for a differential pressure transducer which can measure over a 0 – 5 bar DP while the system is pressurized to a 200 bar line pressure, will the PD33X fit these requirements? The PD33X is available with a 0- 10 bar diff base range which can be scaled in the factory or by the user via the digital coms to be scaled over a 0 – 5 bar diff range. As standard the PD33X can withstand a 200 bar line pressure as long as it is applied to both sides at the same time. There are no mechanical stops built into the transducer to protect it from a 200 bar pressure applied to one side only. 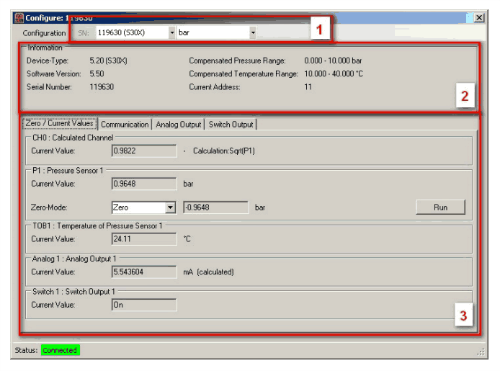 I am concerned about over-pressurizing the PD33X differential pressure transmitter, please could you explain what the over-pressure rating is, and what I can do to prevent it from being exceeded? The overpressure rating for the PD33X relates to the difference in pressure between the two ports of the dp transmitter. If you exceed the overpressure rating between the positive side and the negative side it may affect the sensor performance or damage sensor operation. If the overpressure is a dynamic spike that lasts for a fraction of a second, you could damp it by using pressure snubbers, but care should be taken to ensure one of them does not get blocked over time, otherwise you could have a worse over-pressure situation particularly at relatively high line pressure. For example if your line pressure is 30 bar then you could have 30 bar on one side and 0 on the other if one of the ports becomes blocked and no longer transmits the pressure on one side. You should be able to source snubbers from any hydraulic/pneumatic fitting specialist, there are many different types, so the supplier will probably need to know about the characteristics of the pressure spikes you are trying to suppress. There are other precautions you can take such as mounting the sensor on lengths of small diameter tubing which will provide some degree of damping and locating the sensor away from causes of overpressure spikes such as bends, corners and valves. For a sustained overpressure condition the only way to protect the sensor is to fit relief valves. The effectiveness of the relief valve will depend on how quickly the valve will react to an overpressure condition. Alternatively you could run the dp transmitter output though a controller configured to isolate each pressure port from the process, and equalize the pressure on both sides by opening an isolation valve connecting both ports. What is the response time of the PD-33X differential pressure sensor analog output? The response time is 400 Hz for the analog output. We have a 0-1Bar PD-33X differential pressure sensor, it has worked very well since we received it, however when taking it apart recently it looks like the diaphragm has been damaged somehow. There is a visible dent in the diaphragm. The unit still functions with the exception that the sensor now has a 100mV positive offset on what it was reading before. What do you think may have happened to the sensor internally? The exposed diaphragm is for isolation purposes and behind it is an oil fill. When the diaphragm is dented it changes the volume inside normally increasing the pressure slightly, hence the positive 100mV offset. Over time and temperature cycles the zero offset may reduce. 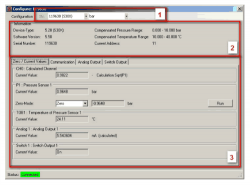 The zero offset reading can be calibrated out either within the sensor itself using the configuration software or via the instrumentation connected to the sensor. In worse cases the dent will cause the isolation diaphragm to touch internal electrical connections to the sensing diaphragm which would cause a fault condition, but this has not appeared to happen in this case, since the sensor is still working ok. However at extreme temperatures or pressures a fault may appear. Depending on the severity of the damage the isolation maybe more prone to mechanical failure in the future due to a weakening of the isolation diaphragm. The question I’d like to have addressed is whether the PD33X dp transmitter allows for the full scale span to be adjusted or preset? For example, it looks like the smallest full scale pressure range that the PD33X can have is a 0 to 1 bar diff. But can I program or have the factory program the full scale range output to correspond to something less than 1 bar? I’m interested in the 0.01% FS accuracy option, but for a much smaller range than 1 bar, 0.01% of 1 bar corresponds to an accuracy of 0.0001 bar (0.00145 psi), while my desired accuracy is 0.000012 bar (0.000174 psi) across span of 0.032 bar (0.47 psi). Please comment on whether this will be feasible. The analogue output of the PD33X can be scaled to anywhere between 0 and 1 bar via the Read30/Prog30 software if used in conjunction with the USB, Bluetooth or RS232 communications cable. The accuracy will always be a function of the base range of 1 bar. The 0.01% improved “precision” is for the digital output and is not available for the analog output. Also the 0.01% precision is only possible for ranges 10 bar and above. If the media is air, then a better alternative would be the PD41X which is a low range dp sensor. The lowest range for the PD41X is 0.030 bar which has a typical accuracy of 0.1% FS over a compensated range of +10 to +50degC (+/-0.00003 bar, 0.000435 psi) for the 4-20mA output and (+/-0.00006 bar, 0.00087 psi) for the 0-10Vdc output. If necessary the PD41X can be re-scaled in the same way as the PD33X. Please select the options you require for the PD33X High Accuracy Differential Pressure Transmitter in your application and request a quote. Which static line pressure will never be exceeded on both ports at the same time? n.b. For positive & negative differential overpressure rating please see product data sheet. Send us your enquiry for PD33X High Accuracy Differential Pressure Transmitter to get assistance with this product type.